That’s the collective thinking underpinning the activities of a peloton of early lithium explorers determined to commercialise this new-age, future-dependent metal with energy storage capabilities equal to that of a hibernating bear amidst a particularly harsh winter. 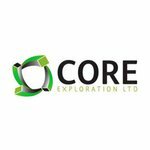 With that in mind one ASX junior lithium explorer, Core Exploration (ASX:CXO), is moving to secure a territorial advantage. CXO owns 100% of the largest lithium tenure in the underexplored Northern Territory – the Finniss Lithium Project. 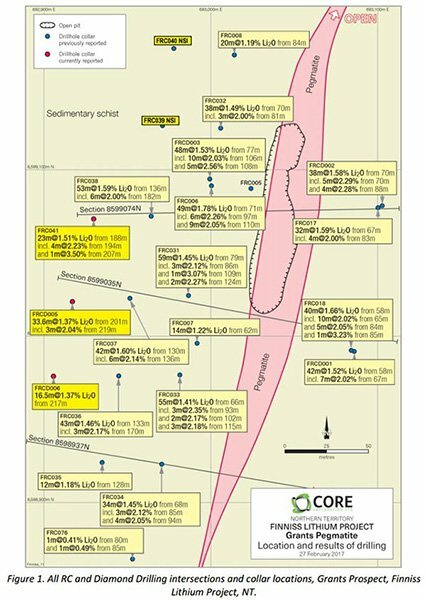 CXO’s Finniss has the highest grade intersections and is the largest pegmatite mine in the Northern Territory, with the largest spodumene pegmatite target. In fact multiple thick, high grade spodumene intersections have been found from a number of prospects at Finniss, which could present as a significant new lithium discovery. With a market capitalisation of just $27 million, there is significant upside for this well placed explorer. The company has $8 million in cash in the bank and is well funded to fast track early stage development. Of course it should be noted that this is an early stage company and investors should seek professional financial advice if considering this stock for their portfolio. 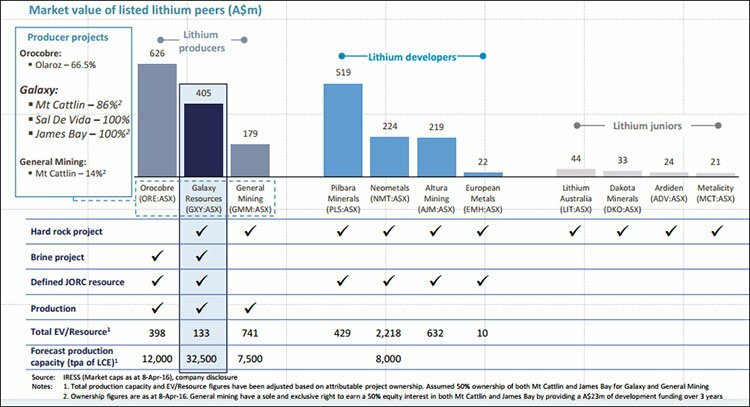 All in all, CXO’s Finniss Project has the grade, scale and surrounding infrastructure to potentially compare with the best lithium projects in Australia including Greenbushes in Western Australia – the highest grade and largest producing hard rock lithium mine in the world. As you can see, it is a favourable comparison with Finniss ticking many of the same boxes, and on its way to matching Greenbushes in every aspect. 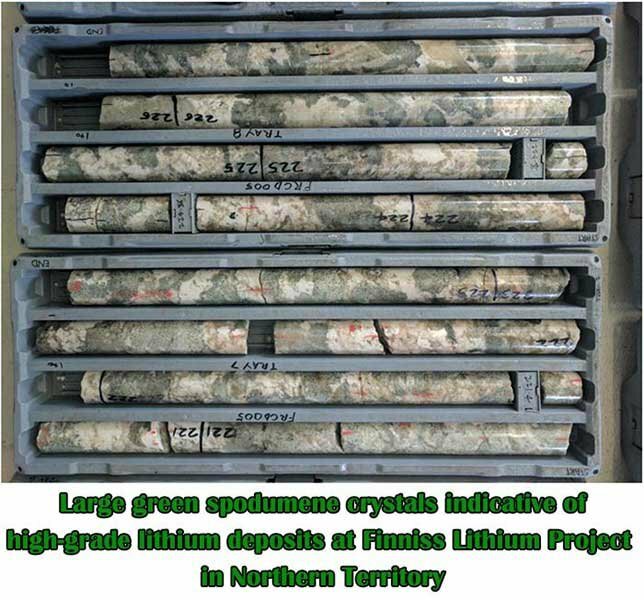 You can read further about the comparison in our July 2016 CXO article Lithium in the NT? CXO About to Find Out , suffice to say the leading indicators for lithium at Greenbushes are also present at CXO’s Top End lithium project. Yet, CXO could have one advantage over it WA peer. 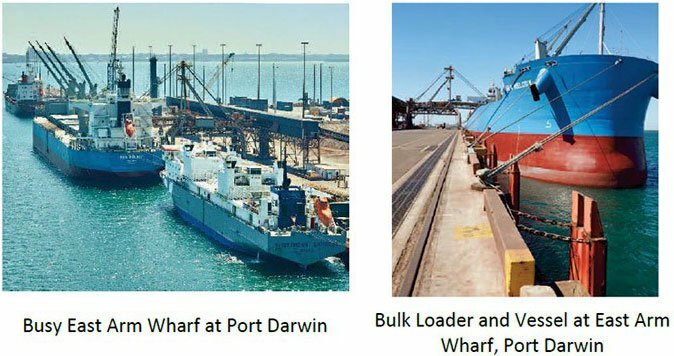 CXO recently signed a non-binding Heads of Agreement (HoA) with Darwin Port that could see Port potentially export lithium products from CXO’s Finniss Lithium Project. The HoA opens up further discussion and negotiation in relation to a binding agreement for the export of 1Mtpa of direct shipping ore or up to 250,000 tpa of concentrates. Located just 70km from the Port, the Finniss Project gives CXO a situational advantage: this Northern Territory lithium play is now in the closest port in Australia to Asian lithium markets. The Chinese government is continuing to scale up its support for new energy vehicles and it is expected the demand for battery-grade lithium carbonate will be a tipping point for the country and its lithium suppliers. China’s demand for battery-grade lithium carbonate was about 27,800 tons in 2015 and is expected to exceed 100,000 tons in 2020. The country’s total demand for lithium carbonate will increase at annual rate of 20% over the next couple years, higher than the global average and approximating 167,000 tons in 2020. CXO could open up a potential logistics chain that is better than many spodumene projects currently being developed in this country. That would mean a high level avenue into a major lithium market, complemented by recent assays that have confirmed high grade spodumene pegmatite continuous over 300 metres in length and up to 30 metres wide. The resource is also open at depth below 200m vertical. The successful Phase 1 and 2 RC and Diamond Drilling campaign has confirmed several significant lithium discoveries, with metallurgical study results imminent and potentially just days away. Did you see our most recent article on CXO? Regular readers may well have read our July 1 st , 2016 article on CXO, titled Lithium in the NT? CXO About to Find Out . In this article we covered CXO’s plans for lithium exploration in the NT, drawing off some of the geological similarities to some of the multi-billion dollar lithium discoveries. 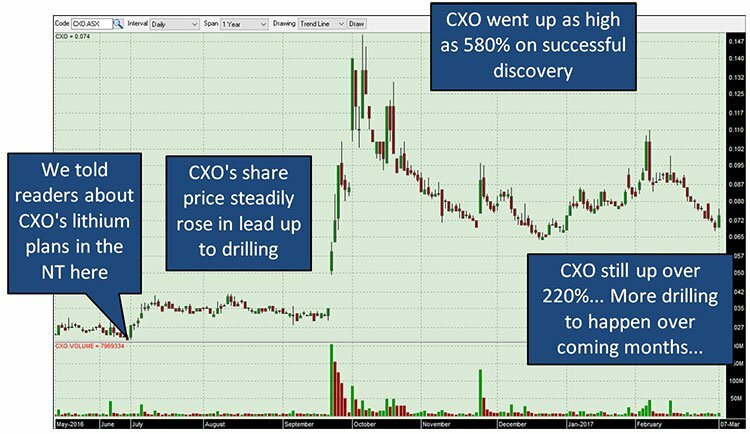 Could CXO go on another run if it hits more widespread mineralisation? There still appears to be plenty of upside in CXO, given it has a relatively small market cap of $27M, given the assets it is sitting on, and the drilling its planning to do this year. And with around $8M in the bank right now, CXO’s enterprise value is also relatively low. CXO is doing everything it can to secure a seat at the global lithium production table, that’s currently seeing new contenders form on almost a weekly basis. It’s all part and parcel of commodity investing — if you see one particular commodity head off to the races because of overarching macro factors, it often means the beginning of a ‘rush’ or ‘boom’. 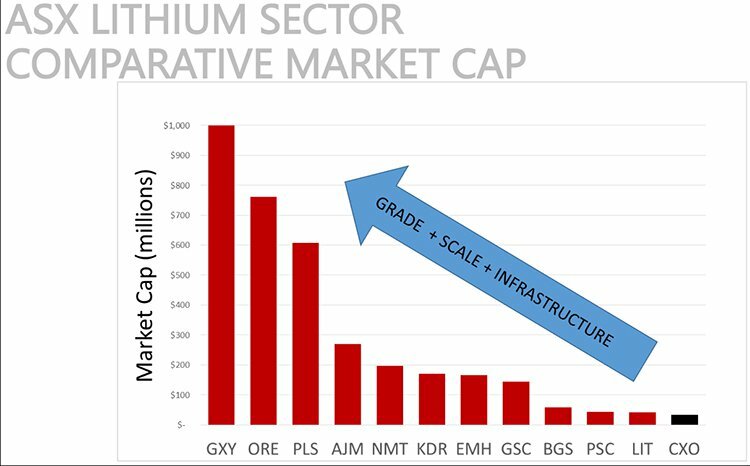 With lithium demand booming, but lithium supplies still stuck in neutral, now could be great time to pick-off some undervalued small-cap lithium stocks, operating in areas close to final point of sale or close to significant supply routes. Now let’s put that in an Asia Pacific context. Australia is Asia’s de-facto commodities trading hub and continues to supply the majority of the world’s Resources in several key metals and minerals. Lithium’s properties, combined with what industrial lithium consumers actually want, mean that it’s not necessarily the size of a lithium resource that matters, but rather the type of deposit and the associated cost of extracting it. 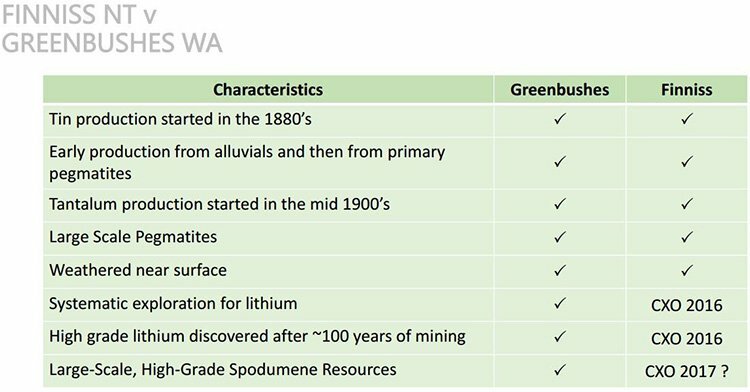 Most of the current wave of Australian lithium exploration has been in Western Australia, most famously epitomised by Talison’ Greenbushes lithium mine — currently the world’s largest known hard-rock lithium Resource. There is also Pilbara Minerals Pilangoora lithium discovery, which also compares favourably to what CXO has under its bonnet. Yet, while WA is proving prolific, the NT is underexplored. CXO has turned its attention to lithium at the Finniss Lithium Project and the Anningie Lithium Project in the Northern Territory, where the company has granted tenements and applications covering 2,500km 2 . As you can see, CXO has snuggled itself into the very heart of the commodities mix in NT. Spread across 5 separate sites (which were recently expanded), CXO is pursuing two of its most highly prospective avenues, namely Finniss and Barrow Creek. The good news for investors is that CXO has a bulky news flow schedule coming over the horizon. That’s the sort of early exploration news we like to see here at The Next Small Cap , and we hope there’s more where that came from. 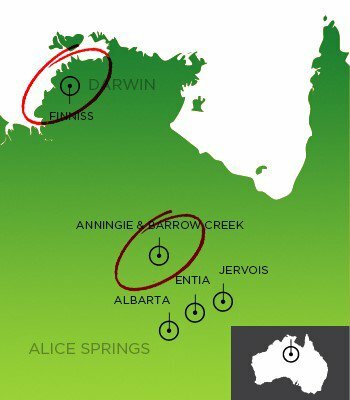 The green-shaded areas indicate the presence of significant spodumene — a key early-warning sign of potential high-grade lithium mineralisation at CXO’s ground in the NT. We can’t wait to see more assay results trickle through from CXO, as these are likely to substantiate the high-grade nature of both Finniss and Barrow Creek. Whilst Finniss may not have a JORC Resource just yet, there could be a whiff of sales revenue in the air for CXO. CXO has signed a non-binding Heads of Agreement with ‘Darwin Port’ in respect of potential export of lithium products from CXO’s Finniss Lithium Project. The agreement includes the option for further negotiations in view of a potential binding agreement, to export up to 1Mtpa of direct shipping ore or up to 250,000 tpa of lithium concentrates. Of course, any export to China is speculative at this stage and investors considering this stock should take a cautious approach to their investment decision. With this deal now signed, CXO is determined to get into early production as soon as possible. In Q4 2016 alone, CXO conducted 2 phases of RC drilling, drilling 66 holes for 8,209m, 4 diamond drill-holes for 475m, shallow RAB for 2,000m and air-core drilling for 2,325m. Further metallurgical results are expected later this month and over the course of Q2 2017, so keep those catalyst-catching antennae well calibrated, dear Next Small Cap readers. The world will produce more lithium-ion batteries in 2018 than the entire world has produced since 2013. Much of the current global lithium supply comes from Chile, Argentina and Australia, particularly out of WA, but CXO has acquired more than 2,500km 2 in Australia’s Northern Territory (NT) in the hope of carving out some early lithium market share, and also, to emulate the feat achieved by Galaxy Resources (ASX:GXY) in 2016. GXY was one of the best performing stocks on the entire ASX in 2016, and the outlook is for more of the same in 2017. Whether CXO can repeat the feats of its peers remains to be seen, and past performance doesn’t directly translate to future performance. Investors should take all publicly information into account before making an investment decision and seek professional financial advice for further information. In terms of the final end-products, lithium has a real shot of gazumping oil as the go-to fuel of tomorrow. 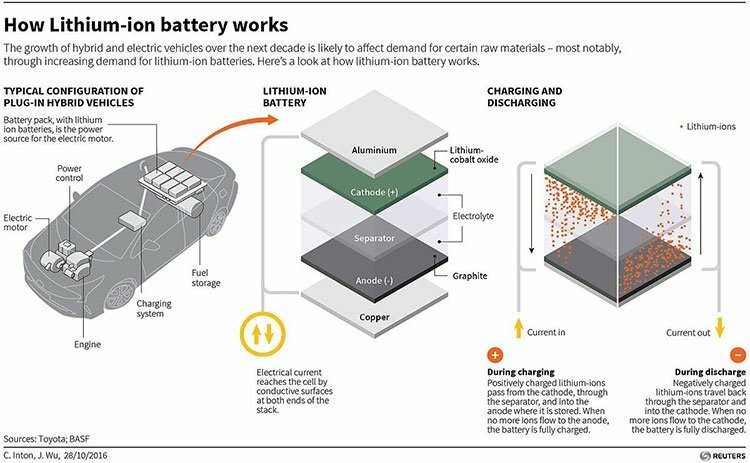 At the end of the day, if the largest developed countries are pushing all their citizens onto electric buses, coaches, trains and cars — well then it’s not a far-fetched assumption to say that lithium will become a fixed part of the furniture in global commodities and global energy. And if public transport (including long-range coaches) are slowly going electric, then it’s a realistic possibility to see electric vehicles take the baton over from combustion vehicles sooner rather than later. One man who foresaw these developments way back in 2008, was none other than the Oracle of Omaha, Warren Buffet. 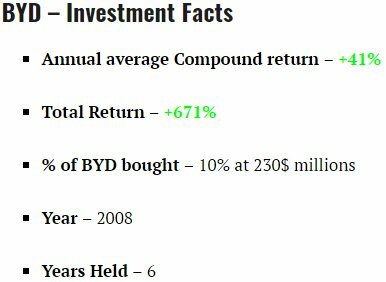 In 2008, world-famous investor and fund manager Warren Buffet bought 10% of BYD for US$230 million. After 6 years of holding his stake in BYD, its value has grown to $1.8 billion — a profit of more than 670%. Of course, not all investments are as successful as that – so apply caution when considering your own portfolio, especially speculative mining stocks such as CXO. Bear in mind that this video was recorded back in 2015, and the Oracle was pretty much on the mark given developments since then. 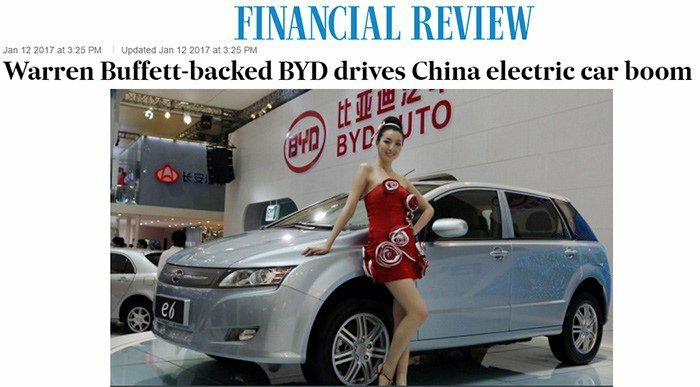 BYD is pushing towards becoming the number one selling EV-maker globally, due to being one of the first manufacturers in this space and because of the awesome demand for anything aimed at the Chinese middle-class. 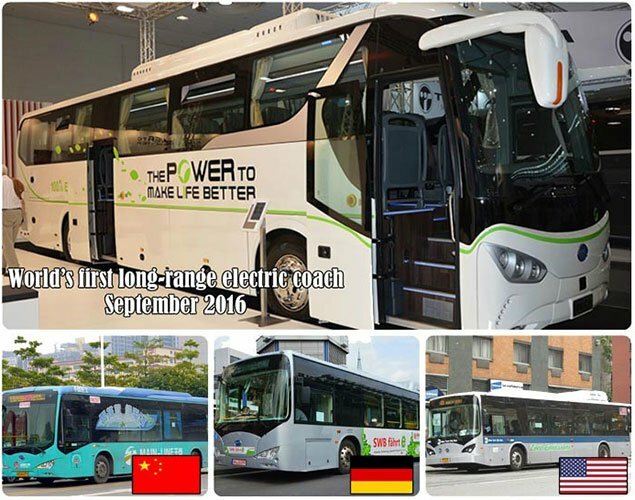 Already, BYD’s buses can be found on the streets of New York, London, Paris, Berlin and Shanghai — and the electric revolution has barely got started. 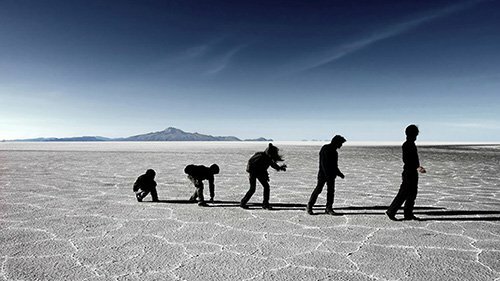 According to the US Geological Survey, with the current global production rate of 37,000 tons of lithium per year, mankind has enough reserves for 365 years — if current demand remains the same. But experts predict that by 2040 the World will be consuming 800,000 tons of lithium for just battery production alone! When other uses such as ceramics, medicine, IT and industrial manufacturing are included, lithium could literally become the equivalent of aspirin, or sliced bread within our generation. The global market for lithium-ion batteries was $11.7 billion back in 2012, with the automotive sector accounting for 14%. Now in 2017, the battery market has ballooned to over $30 billion, with the automotive sector accounting for around 30%. These trends are only becoming more entrenched and exacerbating, rather than consolidating. The world of tomorrow will look nothing like the world of today — and it’s all to do with how empowering lithium can be for the global economy. We can see the first hints of change already. Gadgets are getting sleeker, everything is going electric as well as becoming interconnected. The new titans of commodity markets over the coming years may not be the stalwarts of yesteryear, namely iron ore, crude oil, gold and copper. Quite possibly, the world of tomorrow will be functioning primarily on batteries made out of lithium, graphite and cobalt. Various other technological breakthroughs such as Perovskite and graphene are also growing in parallel, offering a host of supplementary benefits we are likely to see in future. Taking all this into consideration, CXO represents a worthy consideration for addition into commodity portfolios because of its largest tenement position in NT, strong assays so far and a drilling programme about to hit full-capacity next month. These are all very nice caveats that raise chances of CXO lifting higher from its current valuation of $25 million. 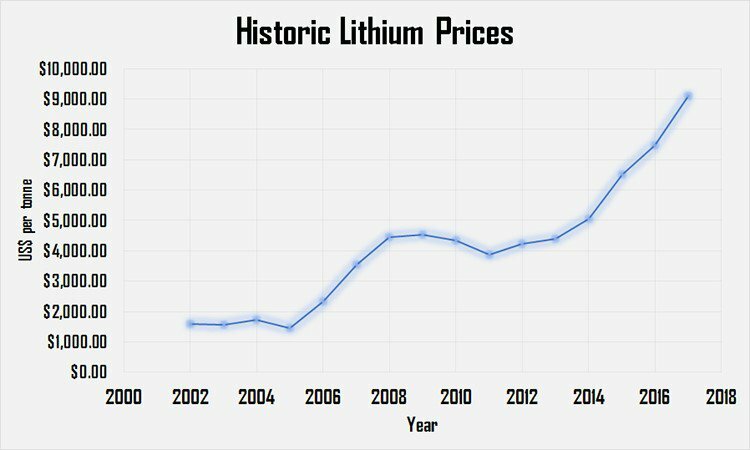 Lithium isn’t just coming; it’s already here, and maybe it’s about time you joined the lithium frenzy before it slips away into the mitts of some other opportunistic investor.